[Pd,SNR] = rocpfa(Pfa) returns the single-pulse detection probabilities, Pd, and required SNR values, SNR, for the false-alarm probabilities in the row or column vector Pfa. By default, for each false-alarm probability, the detection probabilities are computed for 101 equally spaced SNR values between 0 and 20 dB. 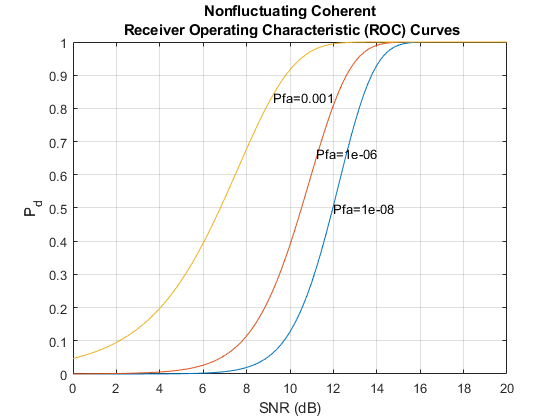 The ROC curve is constructed assuming a single pulse in coherent receiver with a nonfluctuating target. [Pd,SNR] = rocpfa(Pfa,Name,Value) returns detection probabilities and SNR values with additional options specified by one or more Name,Value pair arguments. rocpfa(...) plots the ROC curves. False-alarm probabilities in a row or column vector. Maximum SNR to include in the ROC calculation. Minimum SNR to include in the ROC calculation. Number of SNR values to use when calculating the ROC curves. The actual values are equally spaced between MinSNR and MaxSNR. Detection probabilities corresponding to the false-alarm probabilities. For each false-alarm probability in Pfa, Pd contains one column of detection probabilities. Signal-to-noise ratios in a column vector. By default, the SNR values are 101 equally spaced values between 0 and 20. To change the range of SNR values, use the optional MinSNR or MaxSNR input argument. To change the number of SNR values, use the optional NumPoints input argument. Plot ROC curves for false-alarm probabilities of 1e-8, 1e-6, and 1e-3, assuming no pulse integration.